In late 1961/early 1962, Larry Parnes decided that Billy should have his own backing group. He saw Tex Makins, Georgie Fame, Red Reece and Colin Green rehearsing with a singer called Clay Nicholls, who called his band The Blueflames. Billy decided he liked the Blueflames because of the initials BF. 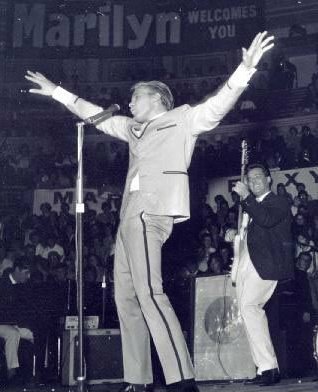 And so Billy Fury and The Blueflames were born. In this picture, Georgie Fame is visible on the left. According to Tex, Larry Parnes sacked them after a few months because they were becoming too jazzy for Billy. In February, 1962, Larry Parnes sacked Billy's backing group, the Blue Flames, without having another band ready to fill the breach. The legendary, inventive record producer Joe Meek contacted Parnes and offered to supply a group, hoping not just to gain extra publicity for some of his artists, but also to lure Billy into his studio. He told friends that he hoped to help Parnes develop a team similar to that of Cliff Richard and the Shadows, and he believed that he was the man to deliver Billy's elusive number 1 hit. Billy was due to tour with John Leyton (for whom Joe produced Johnny Remember Me), Eden Kane, Karl Denver, and a Meek group, Peter Jay and the Jaywalkers (of Can Can 62 fame). Billy and Meek's house band, which had no name, but which had developed from the break-up of Mike Berry's original Outlaws, rehearsed at Meek's studios at 304 Holloway Road, North London, then left for the tour. In the pictured EP, they are wearing their trademark sweaters, for which they were sponsored by a knitting wool firm. If anyone thinks I'm joking, I can supply copies of the pattern. At this point, Joe, who had taken a very close interest in 19-year-old Heinz Burt, decided to promote Heinz's image, giving him a striking appearance by dyeing his hair blond. Billy and the Tornados settled into a summer season at Great Yarmouth. On the evening of Wednesday, July 11, British television carried news of the launch of the world's first communications satellite, and Joe awoke in the early hours of the following morning with a melody line in his head. He summoned the Tornados, who drove from Yarmouth after their evening show two days later, then reported to the studio on the Sunday morning. They worked for 12 hours to put down the rhythm tracks for both Joe's inspired melody and for the B-side. Next day they spent four hours on guitar breaks for the A-side, but they left at 2pm to return to Yarmouth for the afternoon show. Thus was born Telstar, the biggest-selling British instrumental single of all time. Larry Parnes became keen to manage The Tornados and he struck a deal with Joe - Parnes would be in charge of public appearances and Joe would run recordings. Parnes offered to put them on wages of £25 a week, which Clem Cattini managed to haggle upwards before signing. In mid-September, the Yarmouth season ended, and Telstar reached the top 20. By the middle of October, it had sold ¼million copies and was starting a five-week run at number 1. Frustratingly, the Tornados were contracted to be Billy's backing band and they were about to start a 49-night tour. They had been given one, three-minute solo spot on the tour, which was just long enough to play the hottest record of the year, while the show's headliners had never spent a week at number 1. On a rare day off from the tour, the Tornados had a single solo date in Oxford, which was sold out. When the tour ended, Joe took them into the studio and Larry Parnes announced that he had arranged a 10-day tour of the USA in February, with three television spots. In December, Billy presented The Tornados with a gold disc to mark a million sales of Telstar and at Christmas it was the US number 1. By January, Telstar had passed its second million and the follow-up, Globetrotter, was released, eventually reaching number 2 in the UK but flopping in the USA. In the same month, Heinz was extracted from The Tornados to receive even more personal attention from Joe, and Tab Martin joined on bass guitar. The US tour fell through because Larry Parnes refused to take The Tornados if Billy, who had no following on the other side of the Atlantic, did not receive equal attention. The Americans' interest cooled, so the opportunity to promote the first British group to top the American charts was lost. 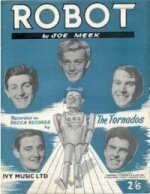 The Tornados' next two British singles, Robot and Ice Cream Man, barely limped into the top 20. Ties with Billy were formally severed in December, 1963. The band had suffered frequent changes in personnel, leading to wasted time rehearsing the new recruits, which was a constant irritation to both Billy and Parnes. And finally, if anyone has ever hankered to kit themselves out with one of the Tornados' trademark sweater, all is not lost! Believe it or not, a knitting pattern was published...and I just happen to have a copy. Click here (PDF file) and get knitting! Joe Meek was a fascinating character, and I recommend anyone who is interested in learning more to read John Repsch's excellent book, The Legendary Joe Meek, ISBN 1-901447-20-0. Links to Joe Meek sites are available from this site's links page. George Bellamy (rhythm guitar), Heinz Burt (bass guitar), Alan Caddy (lead guitar), Clem Cattini (drums), Norman Hale (organ, not in tour group, added for Love And Fury). George Bellamy (rhythm guitar), Heinz Burt (bass guitar), Alan Caddy (lead guitar), Clem Cattini (drums), Roger LaVern (organ). George Bellamy (rhythm guitar), Alan Caddy (lead guitar), Clem Cattini (drums), Roger LaVern (organ), Tab Martin (bass guitar). George Bellamy (rhythm guitar), Alan Caddy (lead guitar), Clem Cattini (drums), Roger LaVern (organ), Brian Gregg (bass guitar). Brian Irwin (rhythm guitar), Alan Caddy (lead guitar), Clem Cattini (drums), Jimmy O'Brien (organ), Ray Randall (bass guitar). Brian Irwin (rhythm guitar), Stuart Taylor (lead guitar), Clem Cattini (drums), Jimmy O'Brien (organ), Ray Randall (bass guitar). Brian Irwin (rhythm guitar), Dave Cameron (lead guitar), Peter Adams (drums), Ray Randall (bass guitar), Roger Warwick (saxophone). Brian Irwin (rhythm guitar), Dave Cameron (lead guitar), Peter Adams (drums), Ray Randall (bass guitar), Dave Watts (keyboard). Robbie Gale (rhythm guitar), Peter Holder (lead guitar), John Davis (drums), Roger Holder (bass guitar), Dave Watts (keyboard). 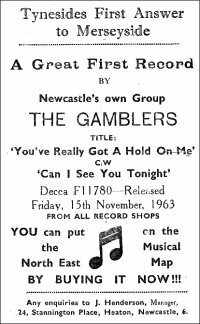 Billy introduced his new backing group, The Gamblers, in January, 1964. They comprised Jim Crawford (lead guitar and vocals) born 24 April 1942, Alan George (piano and organ) born 20 July 1941, Andy McMullen (drums) born12 December 1941, Ken Brady (tenor sax and vocals) born 5 July 1941, Tony Tait (stage name Tony Damond) (guitar, trumpet and vocals) born 4 April 1945, Alan Sanderson (bass guitar and vocals) born 4 February 1941. All were born in Newcastle. McMullen (known as Andy Mac) soon had a serious car accident and was replaced by Ces Baron. They released a single before joining Billy, You've Really Got A Hold On Me/Can I See You Tonight (Decca F11780), in 1963, but it made little impact. Their next attempt, It's So Nice/Nobody But Me (Decca F11872) had just one week in the Top 30, in 1964. At least four more singles were released in 1964-7. They were, however, a very accomplished band, whose live performances were extremely popular. 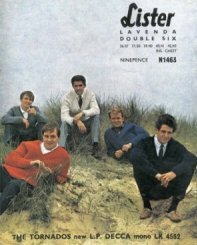 After their own dates in Germany, the Gamblers appeared with Billy at the summer show in Great Yarmouth in 1964 and in the film I've Gotta Horse. The EP Billy Fury And The Gamblers (Decca DFE8641) is highly-regarded. The group subsequently appeared with Billy in the pantomime Aladdin at New Theatre, Oxford. The Gamblers retained their own management, and each appearance or tour was separately negotiated. The relationship petered out in the mid-60s and the group disbanded on July 1, 1967. 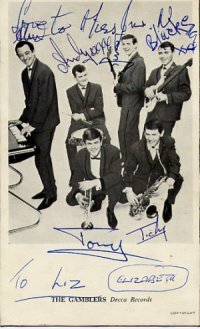 Jim Crawford joined the Alan Price Set, Ken Brady became a night club manager, Tony Tait became one of the two Holder Brothers. Alan George and Cec Baron had left some time earlier. Of their replacements, Bob Elliott backed Billy with the Dakotas, and Dennis Crawford moved to Milan. Tony died of cancer on 2 January 1999. Hear My Life - unreleased single by the late Tony Damond. The PLAINSMEN followed The Gamblers in 1967. 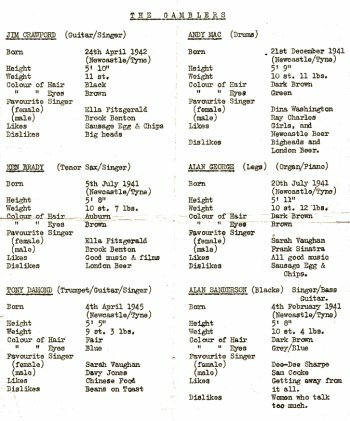 Little is known of them, so any information, including names of personnel, would be welcomed. They were succeeded by DR MARIGOLD'S PRESCRIPTION in 1968 and part of 1969, then MILKY WAY, the NEW TORNADOS, STAR and the FOUR ACES. From 1969 a succession of backing bands appeared, from Mahogany and elements of Mott the Hoople (Ian Hunter called Billy a class act), through the John Mills Band, the New Blue Flames and others. Milky Way metamorphosed into Fury's Tornados and finally Star, a three piece that continued with Billy up to his announced retirement in 1977. for several months during 1975 a totally different band the New Tornados backed Billy. Four of the backing musicians from that period still play today as Fury's Tornados, an integral part of the show, The Billy Fury Story.